DEAR JERRY: Years ago you addressed a strange word in the lyrics of "Moody River." The conclusion then was that even though it clearly sounds like "the vainest knife," it makes very little sense. A friend of mine has a different theory. He thinks it's veinist's knife, believing a veinist to be a regional or colloquial term for one who bleeds people for health reasons. Thus the word would be a form of vein, not vain. If so, the knife would be sharp and the lyrics, to him, make sense. Yet another friend disagrees, saying the veinist theory doesn't work because that person's knife would be aimed at doing good, not harm (i.e., "more deadly than the veinist's knife"). This man therefore votes for vainest, meaning the knife of a very vain person. DEAR DAVE & FRIENDS: I agree with Friend No. 2, and not just because he agrees with me. The process of obtaining blood by intravenous access, be it for therapeutic reasons or for testing, can be done by many different health professionals, from staff nurses to phlebotomists and venipuncturists. But nowhere do I find any references to such a thing as a veinist. Also, vainest and veinist's are not exactly homophones, and no matter whose version you play you'll hear vainest. Finally, and perhaps more importantly, every piece of sheet music I've seen for "Moody River" has "the vainest knife." In order to have it make some sense, I assigned a personality to the knife. Might even give it a name. DEAR JERRY: Occasionally you and your readers ask "how could this record not have been a hit." Well, I can't disagree with any of the songs that prompted that comment. 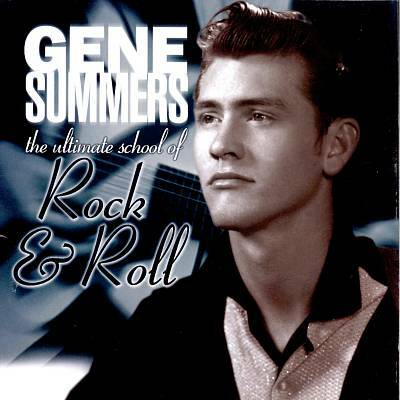 Now here is one I don't think you've ever discussed, and for my money it not being a hit is one of the mysteries of the universe: "School of Rock 'N Roll" by Gene Summers and His Rebels. Did the record reviewers and programmers realize this would eventually be regarded as one of the greatest rock and roll records ever made? Oh yeah, is there any connection between Gene Summers and the Tom Toms ("Big Blue Diamond") and Jac & Jay with the Tom Toms ("Monkey's Uncle")? DEAR WALTER: Obviously the media's collective crystal balls were foggy in 1958, at least with regard to the lofty status now enjoyed by "School of Rock 'N Roll." However, the reviews at the time were relatively favorable. Billboard, in their March 3, 1958 issue, included Gene's record among the week's 10 new releases most likely to be hits. Both "School of Rock 'N Roll," and the flip side, "Straight Skirts," received better comments and higher ratings that week than Ed Townsend's "For Your Love" and Bill Haley's "Skinny Minny," and both of those wound up in the Top 25. "School of Rock 'N Roll" just never took off the way it seemed it would. It wasn't helped much by being the first release for a brand new label (Jan 100). It would have been interesting to see how much better this, and some of Gene's other tunes, would have done on one of the major labels. Summers' involvement with the Jac & Jay single is a bit more complicated than just he and they both being backed by some Tom Toms. Realizing no one could explain this story any better than Gene Summers, and since he has often encouraged me to call him whenever I needed info, I did just that. Interestingly, when I spoke with him (July 3) he was on his way to DFW to board a flight to London. He, Jack Scott, and Hayden Thompson are headlining "The Wildest Cat in Town Summer Weekend" in the UK. All three are members of the Rockabilly Hall of Fame. "The A-side, "Monkey's Uncle" (Shane 47-2), is properly credited to Jac and Jay with the Tom Toms. Jac (Jack Castleberry) and Jay (James McClung II), along with Charlie Mendias; C.B. Williams; and Ernest Walker, were in fact all members of the Tom Toms, who backed me on other recordings. One of those was my best seller, "Big Blue Diamond" (Jamie 1273), also released in 1964. "On the flip side, "Peanut Butter," I am featured, but the backing is by the same quintet (a.k.a., Tom Toms) heard on "Monkey's Uncle." Even so, I am not identified. The label credits only Jac & Jay with the Tom Toms." Travel safe old friend. I know you and Jack Scott will have those Brits rockin' in the aisles.